An unexpected Jewish migrants’ influx from the crumbling Soviet Union and its successor states has “saved” and stabilized the Jewish communities in Germany since the 1990ies. Moreover: The FSU immigrants and the growth of the communities opened surprising perspectives for building a “New German Jewry” – in the country of the former Nazi perpetrators. Aside from the curiosity that many Jewish communities now rather communicate in Russian language, the Jewish “infrastructure” has undergone a stunning renewal: New synagogues have been built across Germany, Jewish kinder gardens, schools and even Rabbinical seminars have opened their doors. Though, the question remains whether the new developments will end in a “New German Jewry”, or just being a flash in the pan. 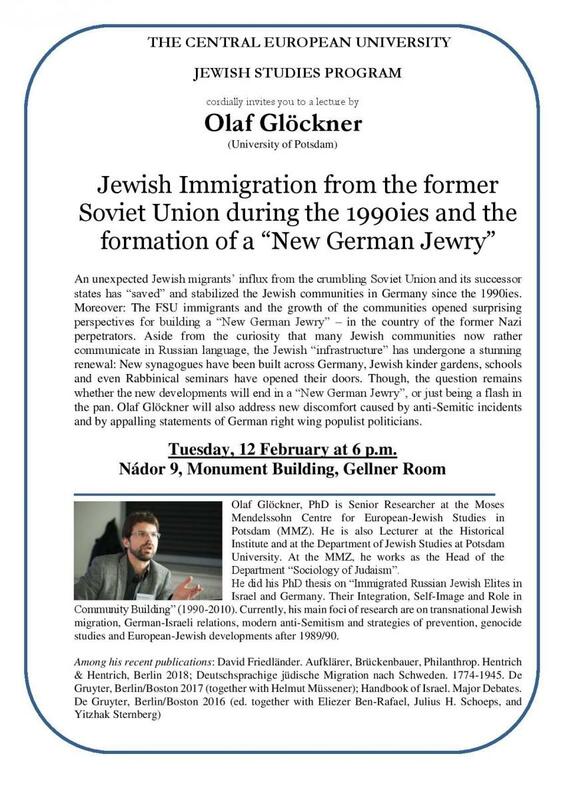 Olaf Glöckner will also address new discomfort caused by anti-Semitic incidents and by appalling statements of German right wing populist politicians.